Japanese World War II map illustrating Japanese imperial ambition in the Americas. 改新世界時局要圖南北アメリカ篇 / Revised New Map of the World's Current Political Situation. North and South America. 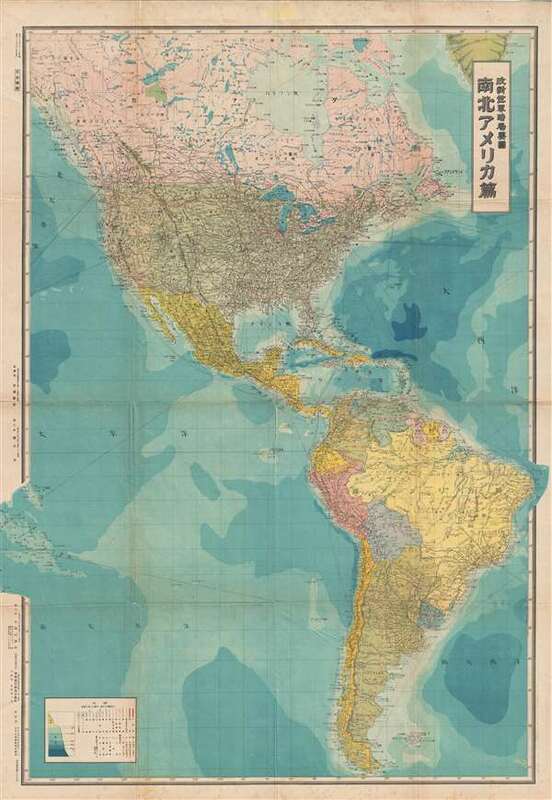 This is an unusual large-format World War II Era 1943 (Showa 18) Japanese map of North and South America. Coverage extends from northern Canada and the Hudson Bay to Tierra del Fuego and as far west as French Polynesia. Oceanic depths are illustrated by shading. Air routes to and from major cities are also noted. This unusual map was issued by Daidō Shuppansha (大同出版社) or Daido Publishing Company. It is stylistically similar to the map of the East Asian Co Prosperity Sphere Series, but clearly not a part of that set. Issued at the height of World War II, this map illustrates Japanese interest in the New World as part of their eventual path of conquest. This map is extremely rare and we have not encountered another similar example. There are no references to it in the OCLC. Very good. Minor wear along original fold lines. Else clean. Slight foxing to margins.